Remove the shock tower cover by popping up the rear of the cover with your fingers. Remove all four 14mm nuts (see photo). I left the strut tower brace in place, it doesn't need to come off. Remove the rear tire. Remove the 14mm nut on the antiroll bar, the nut is on the other side of the bar. (see photo) Remove the 17mm nut on the bottom of the shock. Mine were seized up pretty good. I had to squirt and soak them with Liquid Wrench to break them loose even with a 1/2 inch impact wrench @ 120 psi. I alternated between loosen, then a short shot with the impact wrench set on tighten and then hit it hard on loosen. On the right rear I had to use a big 1/2 inch breaker bar and tap it with a hammer a few times (I even stood on the wrench handle to no avail). After continued assaults with the impact wrench the nuts finally gave in. 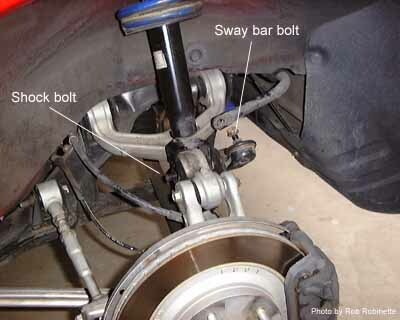 Rotate the bolt to pull it lose from the antiroll bar (see photo) and remove it. You may need to lift the wheel hub a little to make the removal easier. Now the shock is ready to come out. Lift the shock over the bump in the control arm and lower it out of the fender well. 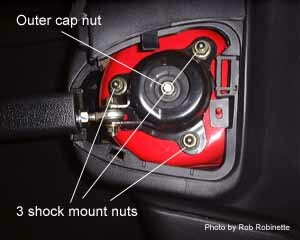 Remove the white plastic isolator "washer" from the shock spring cap. Loosen the 14mm nut on the top of the shock a couple of turns BUT DO NOT REMOVE IT YET! The coil springs have a considerable amount of energy stored in them, do not under any circumstances remove the spring cap without first compressing the springs. 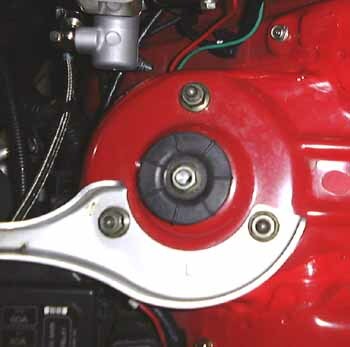 If you don't use spring compressors the cap nut will fly off at high speed in one direction, the shock will go in the other direction and the tip of the shaft will strip as the nut flies off. 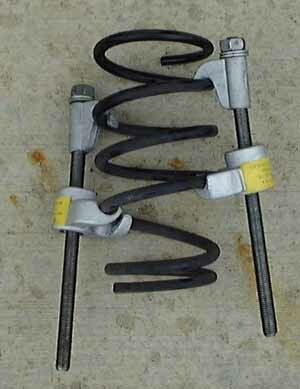 After-market springs may be short enough that they don't need to be compressed but the stock springs need a compressor. Put two spring compressors on the spring and tighten them down. Carefully remove the cap nut, keep your fingers clear of the cap nut and spring and wear safety glasses. 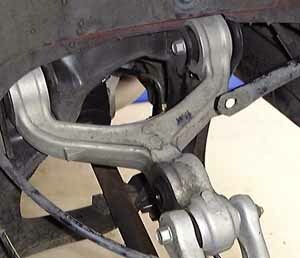 If there is any resistance to remove the nut when you get down to the last few threads then the spring compressors should be tightened up until the nut will turn by hand-but use a wrench just to be safe. Separate the shock from the spring and take the spring cap off the spring. Get the replacement spring, the rear springs are larger in diameter than the fronts and the small end of the spring goes on the shock, the large end goes on the spring cap. Put the shock together to see if you need the spring compressors or not. With shorter lowering springs they may fit without being compressed. When you put the shocks together remember the labeled side of the shock faces the middle of the car and you need one of the three pointed bolts on the top of the shock cap facing the center of the car-look at the shock tower to see what I mean-make the holes line up. The bottom of the spring needs to line up to the indentation on the shock, the shock cap really doesn't have to be lined up with the spring. If you need to, put the spring compressors on and tighten them down. Place the spring on the shock, the shock cap on the shock shaft, then the large rubber cap, the metal spacer, and finally the 14mm cap nut. Tighten the cap nut. Put the large white plastic isolator "washer" back on, get a 14mm nut ready near the shock tower, put the shock up into the fender well, poke its three pointed bolts through the shock tower holes, make sure the rubber "donut" is lined up so the shock shaft will go through it and put a 14mm nut on one of the pointed bolts to hold the shock-but don't tighten it yet. 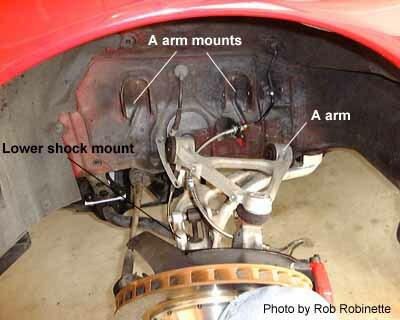 Lift the shock while you push down on the wheel hub to get the shock over the hump in the control arm. To line up the bottom of the shock with its bushing you may need to twist it while you lift the wheel hub a little-all this while you insert the bolt (I used my legs to lift the hub, twisted the shock with one hand and inserted the bolt with the other. Rotate the bolt and insert the antiroll bar bolt into the antiroll bar. Install the 14mm antiroll bar nut and 17mm shock nut but don't tighten them yet. Install and tighten the four 14mm nuts on top of the shock and replace the shock tower cover. Tighten the antiroll bar nut and shock nut. Torque Values for Rear Shocks Inner (lower) shock cap nut 12-17 foot pounds; outer (upper) shock cap nut 24-33 ft lbs; shock tower bolts (three) 34-46 ft lbs; lower shock nut 69-81 ft lbs; antiroll bar nut 40-56 ft lbs. Remove the 12mm bolt from the ABS sensor. Remove the sensor by gently twisting it with your fingers--it will slide out. Remove the two 12mm bolts holding the ABS sensor line bracket to the upper A arm. Carefully place the ABS sensor away from the shock to get it out of the way. 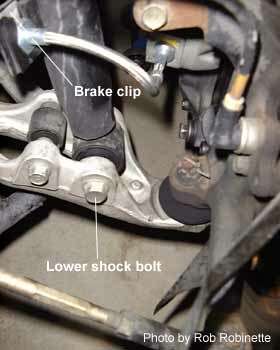 Remove the spring clip from the brake line mount on the shock. It comes out easily if you tap it with a hammer and screwdriver from below, or use pliers. Remove the 17mm nut and bolt on the bottom of the shock. An impact wrench comes in handy here. I had to use a rubber mallet and a large screwdriver to knock the shock out of its lower mount. Be careful, don't damage the shock. Pull off the small rubber shock tower cap by hand to expose the outer shock cap nut. Remove all four 14mm nuts on the shock tower. Remove the two 14mm nuts and bolts from the upper A arm fender well mounts. 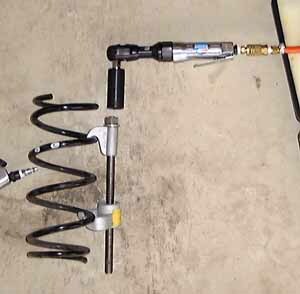 Pull the upper A arm out of its mount and toward you a little, lower the shock and tip the top of the shock toward you to clear the fender then lift it out. Put the A arm back in its mount temporarily (don't let the wheel hub just hang). Follow the directions in the Rear Shocks section to disassemble and reassemble the shocks and springs. Reverse the disassembly instructions to put the shock back in. Use Lock-Tite on the nuts and bolts and torque them to spec-see below for torque values (you don't want them falling off). Torque Values for Front Shocks Lower shock nut 69-86 foot pounds; A arm nuts 44-54 ft lbs; inner (lower) shock cap nut 12-17 ft lbs; outer (upper) shock cap nut 24-33 ft lbs; shock tower bolts (three) 34-46 ft lbs; ABS sensor bolt 12-16 ft lbs; ABS sensor wire bracket bolts 12-16 ft lbs. The brake line will only fit in its mount one way, it has one corner of its hex nut rounded off. The mount is rounded in the same way. Fully insert the line and slide on the brake line clip.